Mission is on a mission. The athlete-engineered skincare line is purposely targeted for athletes. Their spokesperson is Serena Williams and the products pack a punch as intense as her swing. 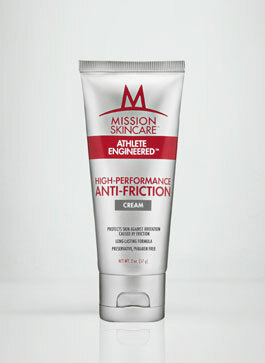 I tested two products from their line: Mission High Performance Anti-Friction Cream and Refreshing Foot Therapy Cream. At first, I was confused on the use of the Friction Cream ($12.99, 3 oz) as I don’t experience chafing among my body parts. However, it proved to be a wonderful barrier between my skin and fitted gym clothes. Not to mention that it did not stain my Stella McCartney shirts. There was a smooth barrier which kept me comfortable and not irritated during high performance activity; otherwise known as sweating. The formulation was thick but not greasy and it was a product that needed to be worked into the skin for maximum protection. The secondary benefit was that it hydrated my skin. 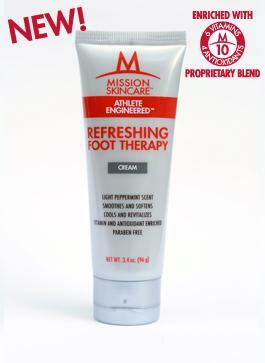 The second product I tried was the Refreshing Foot Therapy Cream ($8.99, 3.4 oz). The smooth lotion is made of jojoba, sesame, grape seed, cucumber, vitamins and antioxidants. 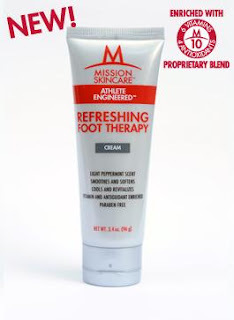 I have standing weekly pedicures and this product was comparable to other foot products on the market, especially with its peppermint, cooling sensation. The Mission Skincare line is very basic and makes no fantastic beauty claims. It’s made for athletes who’s focus is the sport; not cosmetic factor. 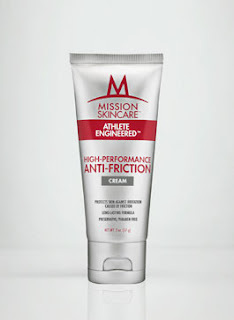 I was more impressed with the Anti-Friction Cream as I wasn’t aware such a product existed at a reasonable price point.